"You walk the pavement, spangled with a thousand colors, but between the light�that's where the darkness is. It's Broadway�my beat." Larry Thor, a staff announcer turned actor with an expressive and powerful voice, played the role of Detective Danny Clover. 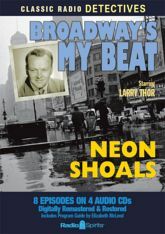 His beat was Broadway, and each week he narrated a new tale of nighttime drama along the Great White Way. Writers Morton Fine and David Friedkin delivered scripts of elegant intricacy that turned routine description into near poetry. Three soundmen worked in unison to create one of the densest soundscapes on radio - capturing the chaotic buzz of the New York night as a counterpoint to the music and dialogue. Produced and directed by Elliott Lewis, it was the most lyrical crime show on the air. In eight digitally remastered episodes, when quiet women and well-off men meet unfortunate ends, Clover is there - backed up by loyal friends Sgt. Tartaglia (Charles Calvert) and Sgt. Muggavan (Jack Kruschen).